A challenging aspect of designing opinion surveys in countries with different cultures and languages is making sure we understand what people are thinking about the subject we’re studying, in their own words. 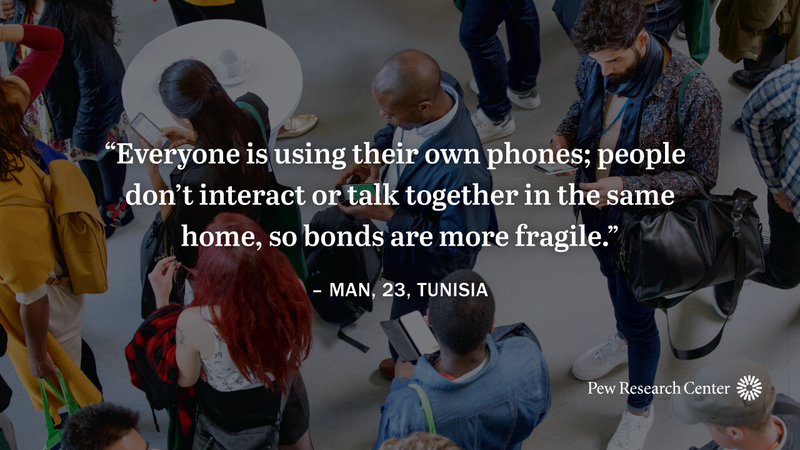 So when we began our recent study of mobile phone and social media use in 11 emerging economies, we started by conducting focus groups with diverse participants in four of the countries studied: Kenya, Mexico, the Philippines and Tunisia. The groups included smartphone users of different ages and educational levels, as well as people with basic phones. Unlike some focus groups which are aimed at understanding how to persuade people to like a product or political candidate, our groups were exploratory and shaped by broad questions about the social impact of mobile technology and the internet. Given the open nature of the conversations, one of the most striking elements of the focus groups was the level of consistency exhibited by the participants both within and across countries. Regardless of their age or direct experience with technology, groups often came up with similar lists of positive and negative changes brought about by mobile phones and an increasingly digital environment. The content of these focus groups was wide-ranging and touched on a number of issues. But four themes emerged in those discussions and were ultimately incorporated into our survey as a result. Below, each of these themes is paired with quotes taken directly from the focus groups that highlight the ways in which people see technology use. People see technology often helping – but sometimes harming – their interpersonal relationships. Those we spoke with in the focus groups see mobile phones affecting their interpersonal relationships in both positive and negative ways. We heard repeatedly that the ability to stay in touch with people who live far away is a key benefit of mobile phones and social media. This was especially true in groups in which the participants lived far from home or had relatives who lived abroad. But people also expressed concerns that technology is hastening the demise of face-to-face communication, or noted what they saw as the shallowness of talking online to “friends” who are not friends in real life. Based on these and other comments, we added questions to the survey intended to gauge people’s attitudes toward the impact of mobile phones on direct, interpersonal communication, as well as on connections with people who live far away. The survey’s results showed a similar tension across all 11 countries analyzed: Mobile phone users nearly universally say their phones help them stay in touch with those who live far away, even as majorities of adults in all countries say people should be very or somewhat concerned about losing the ability to communicate face-to-face because of mobile phone use. The impact of technology on children is a key source of concern for parents and non-parents alike. Parents in our focus groups also spoke at length about their concerns that technology is negatively affecting their relationships with their children. But these concerns were not limited to parents: Non-parents also expressed concerns about the impact of screens on children in their country, and about the broader societal problems that might come from children being exposed to things that may not be appropriate for them. After hearing these concerns in the focus groups, we added multiple questions to the survey about the impact of phones on children. And the results from the survey indicate that the concerns about children raised in the focus groups are common in each of the 11 emerging economies surveyed. Technology is affecting people’s most intimate relationships.The impact of technology on romantic relationships was not a topic we originally intended to ask about in the survey. But in the focus groups, we heard repeatedly about the ways in which people track their partners’ online and mobile activity. Some were unabashed about their own online monitoring and highlighted the importance of keeping tabs on their partners. Others pointed to the ways in which these behaviors could result in jealousy or friction in relationships. We included a question about this topic in the survey and found that, across the 11 countries polled, a median of 26% of those whose partner or spouse uses a mobile phone have indeed monitored what that partner is doing on their phone. Concepts like “fake news” and misinformation resonate across cultures. We had always intended to ask our survey respondents about news on social media – specifically, whether such news is easily accessible, up-to-date and tailored to users’ personal interests. But in the focus groups, we were struck by how much “fake news” as a concept came up during the sessions. Indeed, even though the bulk of the focus groups were conducted in a foreign language, the phrase “fake news” was sometimes mentioned in English. For some, concerns about fake news centered on not knowing who is spreading a particular piece of information and finding it difficult to verify. Participants in the Philippines, for example, mentioned reading on social media that mobile phones caused radiation poisoning. Others worried about being actively misled by posts on social media, and not being able to know what was truly happening until the stories they encountered on social media were reported on the nightly news. Still other discussions revolved around the related concept that social media is fueling animosity between political parties (in the Philippines and Mexico) or tribes (in Kenya). Based on these conversations, we added a series of questions to the survey designed to capture people’s trust in different information sources, as well as the extent to which they think social media and other technologies are encouraging misinformation or political divisions. The findings from these questions will be released in a Pew Research Center report later this year.